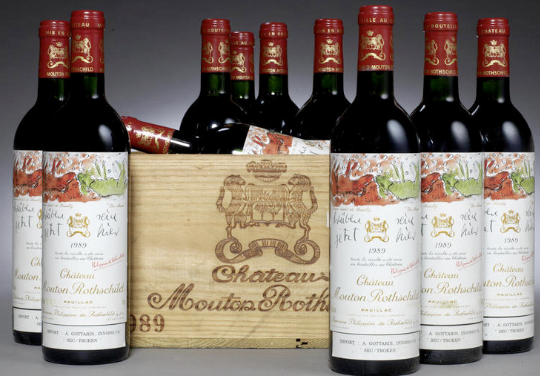 A collection of Mouton Rothschild spanning five decades and rare German wines will be part of what auction house Bonhams promises to be, “one of the widest and most interesting selections of wine to come to auction this year”. Burgundy, white Bordeaux and top Italian wines will complement the main attractions at the London sale on 11 July, as will Rhône and sweet Loire wines from a “distinguished college”. The greater part of the Bordeaux and the collection of Mouton (which spans 1955 to 2008) comes from a collector in Austria. Vintages include the 1955 and 1966 (£850-£1,000 together) as well as two bottles of the 1959 (£2,800 – £3,200) and a collection including the 1961, 1980 and 1975 (£1,000 – £1,500). There are fuller cases of more recent vintages. Meanwhile it was a UK collector who amassed the 20 lots in the German collection. Famous producers include Schloss Sarstein, Fritz Haag, Max Ferd Richter, Dr Bürklin-Wolf, Dönhoff, Dr Bassermann Jordan and von Schubert. This “eclectic” segment of the auction also includes Paul Jaboulet’s Hermitage, a wide variety of Loire and Alsatian wines, Austrian Grüner Veltliner, Tokaji and Yquem. From a Belgian collection comes a “wonderful array” of top flight Italian wines from Gaja, Sassicaia, Case Basse and La Spinetta among others, while there is also a good range of Ports throughout the auction including Dow 1977, 1994 and 1997 and Taylor 1977.